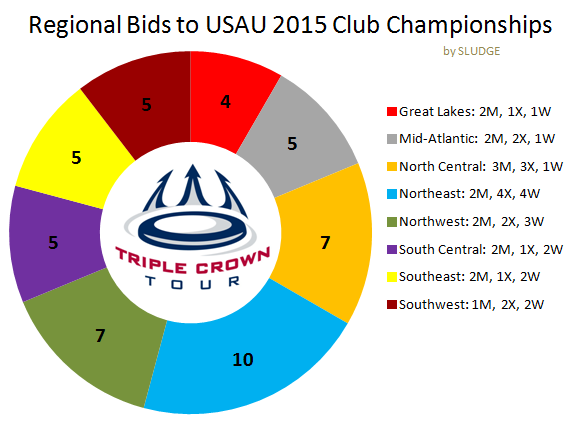 The 48 total club bids were allocated to the 8 geographic regions - Great Lakes (4), Southeast (5), Southwest (5), South Central (5), Mid-Atlantic (5), North Central (7), Northwest (7), and Northeast (10). 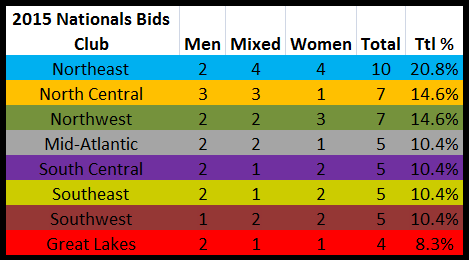 The Northeast region with 2 bids in Men's, plus 4 bids in both Mixed and Women is #1 in total bids. 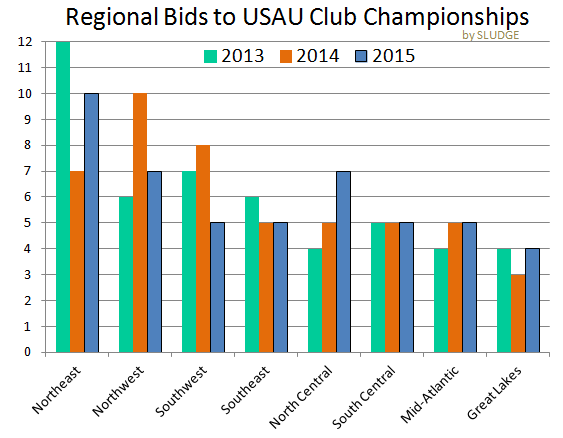 Compared to last year, the Northeast region increased their bid total by 3 teams (~43%). "I'm at an age when my back goes out more than I do." The most recent inventor interview from David Friedman's series profiles Alan Adler - the inventor, engineer and manufacturer of the Aeropress Coffee Maker and the Aerobie Flying Ring. Adler - a lookalike to Walter White (Breaking Bad) - drops some serious science about his inventions. 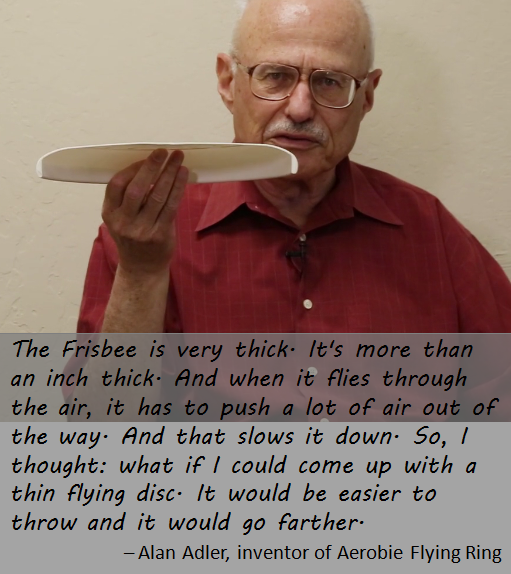 Alan Adler: "The Frisbee is very thick. 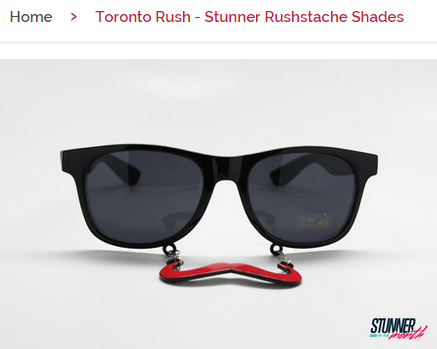 It's more than an inch thick. And when it flies through the air, it has to push a lot of air out of the way. 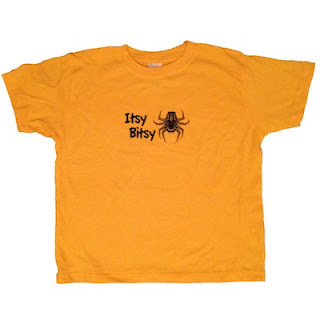 And that slows it down. So, I thought: what if I could come up with a thin flying disc. 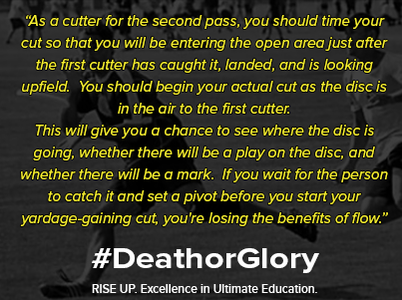 It would be easier to throw and it would go farther." According to the "secrets of a flying ring-a-ding" drawings, the Aerobie applies similar aerodynamics of a plastic flying disc. 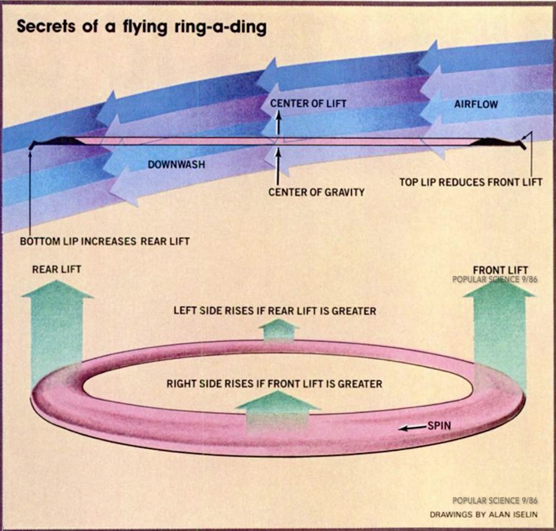 Screengrab of "Secrets of a flying ring-a-ding"
"The Farthest Human Thrown Object in History" mentioned in Adler's interview was a throw using a forehand motion with an Aerobie. This concise interview wonderfully demonstrates Adler's passion toward his practical inventions. 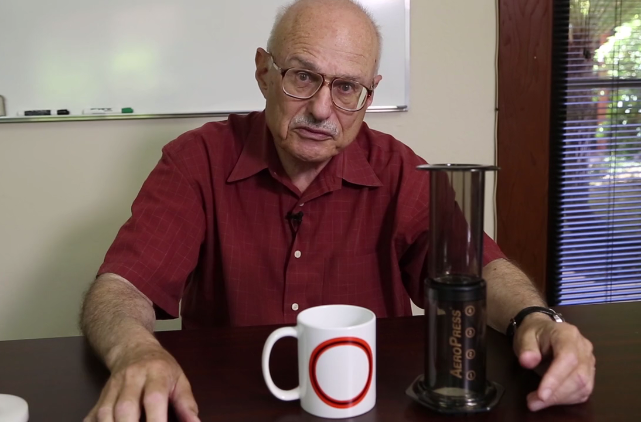 The closing scene shows Adler with a freshly brewed coffee made from an Aeropress in a coffee mug adorned with an Aerobie Flying Ring. 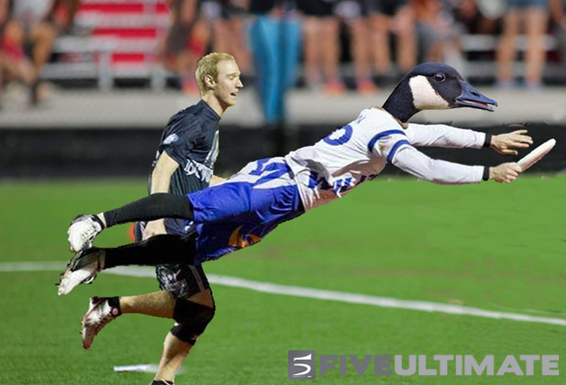 ...Goose moved to lay out for a hammer, but flew just a bit too close to his defender. In the tumble to the turf, Helton's human mask was knocked clean off. 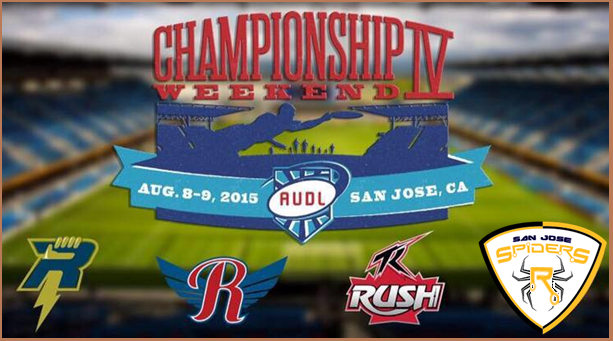 No word yet on whether the AUDL will move to disallow birds from the league. At the time of writing, the league's rules about enormous animals playing as humans are still unclear. The series evaluating the team logos and nicknames of the professional Ultimate leagues is complete. 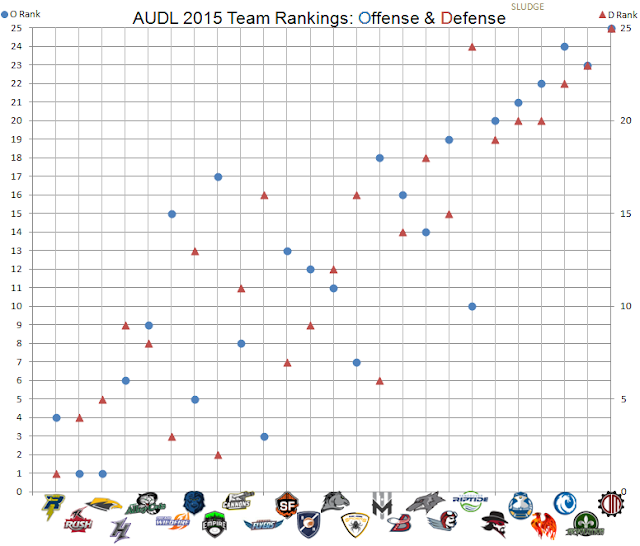 A compilation of final grades for the 2015 AUDL teams are below. In a Silicon Valley Business Journal (August 7) article profiling Rob Lloyd, the owner of American Ultimate Disc League, attendance figures were tossed around. 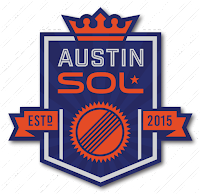 Attendance numbers have been known from only a few teams - Madison Radicals (2013, 2014), Salt Lake Lions (2014), Montreal Royal (2015). This SVBJ article cites total attendance for the entire league in the last 2 seasons - 80,000 (2014) and 130,000 (2015), which averages to ~672 per game per team in 2014 and ~743 per game per team in the most recent season. 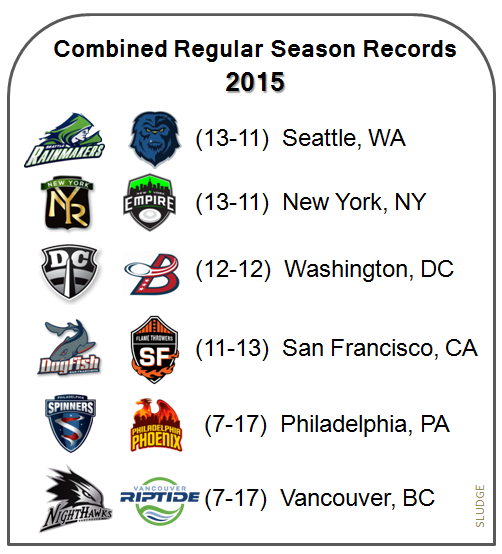 The attendance total of the 2015 season - which added 9 new teams - is a 62.5% increase from 2014. 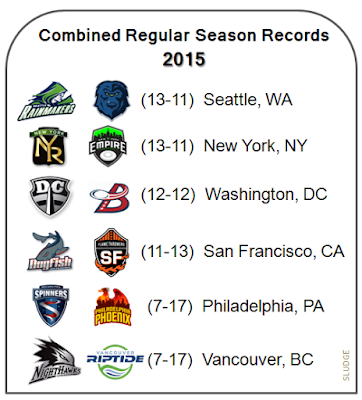 NOTE: Cited numbers did not indicate whether post-seasons games were included in total. Graphed data assumes only regular season games. 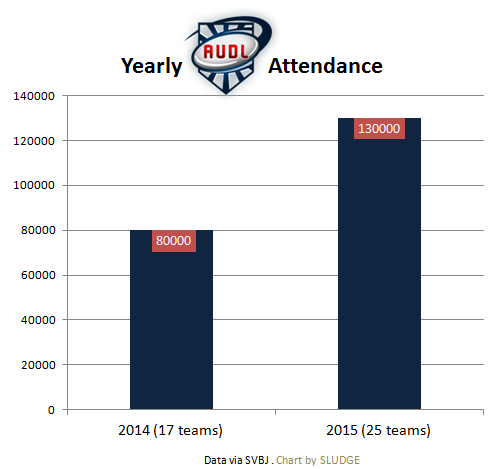 Using the average ticket price in 2015 and the total attendance in the 2015 regular season, the grand total of AUDL ticket sales would be over $1 million; $1,350,700 to be exact. NOTE: This assumes attendance total was all "paid" attendees. Article text: AUDL attendance hit 130,000 this year, up from 80,000 the year before — largely due to the addition of eight new teams. But Lloyd said game attendance is growing, too. 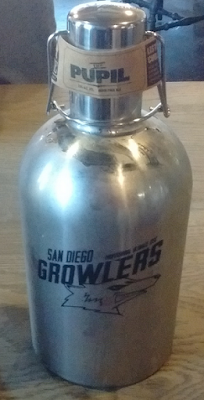 "We are doing really well on the West Coast and in the Southeast," Lloyd said. "Wherever we see high densities of universities and Millennials, the sport is really, really engaging with them." 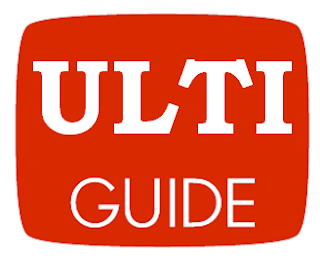 Silicon Valley has a long history of influential tech and venture Ultimate players including Google's Sergey Brin, Draper Fisher Jurvetson's Steve Jurvetson, 500 Startups co-founder Dave McClure, PayPal co-founder Max Levchin and Pebble smartwatch founder Eric Migicovsky. Lloyd said the league decided to rent the San Jose stadium, "not because we needed 18,000 seats but because it is perfect for this experience with the fans very close to the action." Avaya Stadium was chosen because it has festival space, which will be used for a $1 million charity challenge in which 26 teams of local technology, venture and sports personalities will compete in various events over the weekend. Some of the charity competitors are Lightspeed Venture Partners, Cisco, EMC, SAP, SolarCity and Salesforce. "We think it would be great if we could get 5,000 to 7,000 people at this weekend's games but you just never know with these things," Lloyd told me. The biggest crowd to date has been 3,000 at a tourney [sic] in Montreal. According to Mark Lloyd, a total of 3800 attended the three weekend games. 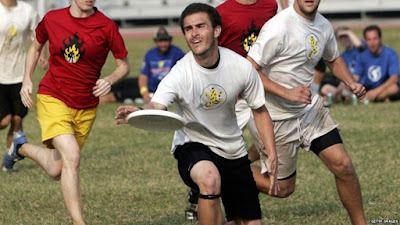 B) Chuck Kindred's gravity-defying hairstyle. 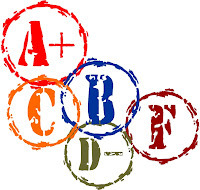 C) The ridiculous amount of money donated to charity - $750,000! An amount equivalent to buying 30 AUDL franchises. 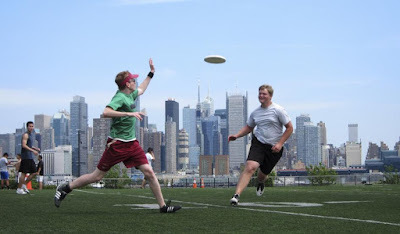 D) How cool it would be if the carnival-like disc games of Accuracy Challenge and Zip-Line Catching would travel with each ESPN3 broadcast next season! 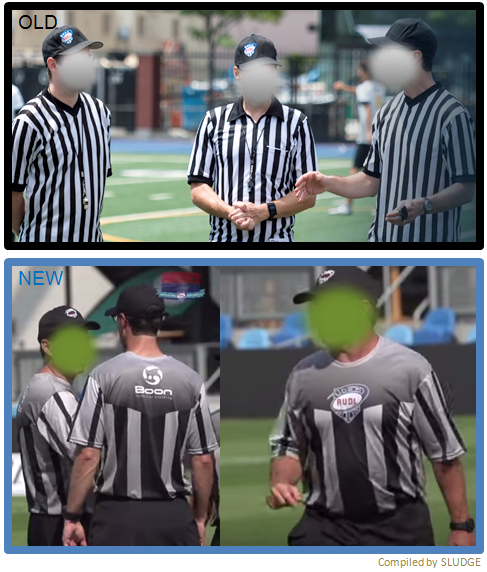 E) The swanky upgrade to the AUDL ref uniforms. The former ref unis were pretty standard black and white zebra stripes. As if a sales associate just punched out from their job at Foot Locker. The new ref unis from Boon Technical are black and light gray striped with a solid dark gray on the front chest and back shoulder. The round/crew neck jerseys prominently show the red, white and blue AUDL shield on the front and the logo of the manufacturer (Boon) between the shoulder blades. The only problem with the new ref tops is the stripey design could be mistaken for a Minnesota Wind Chill jersey. 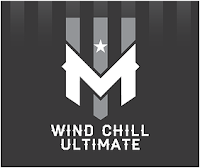 A Pittsburgh club ultimate team was forced to change their team name because their name was considered out of compliance with USA Ultimate's Name/Logo/Uniform Guidelines. The team originally known as Muff 'n Men (hey, it's a mixed gendered team!) renamed itself as "The Muffin Men" for the rest of the club season. Name change is sad but true. Finishing this season as "The Muffin Men" and will revisit the name at the end of the season. 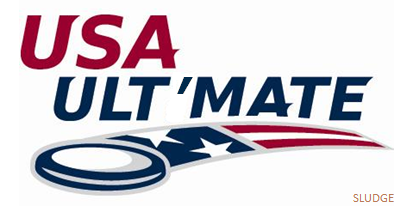 To assist the team name transition, The Muffin Men will borrow the extra letter from USA Ult'mate. 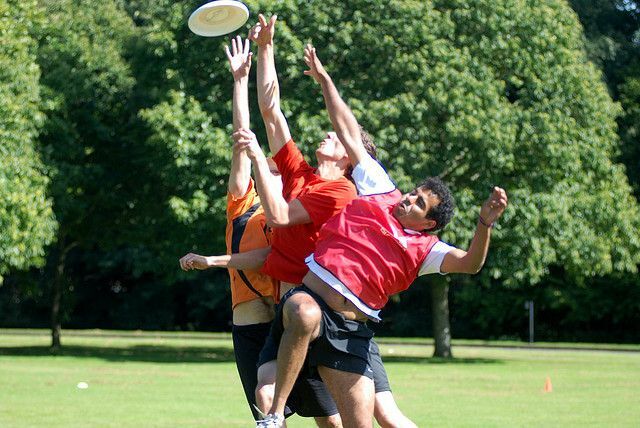 There's been an incredible amount of articles published about the sport of ultimate stemming from the Olympic recognition. Below is a compilation of all the images that accompanied the articles in an attempt to demonstrate our sport. Some good. 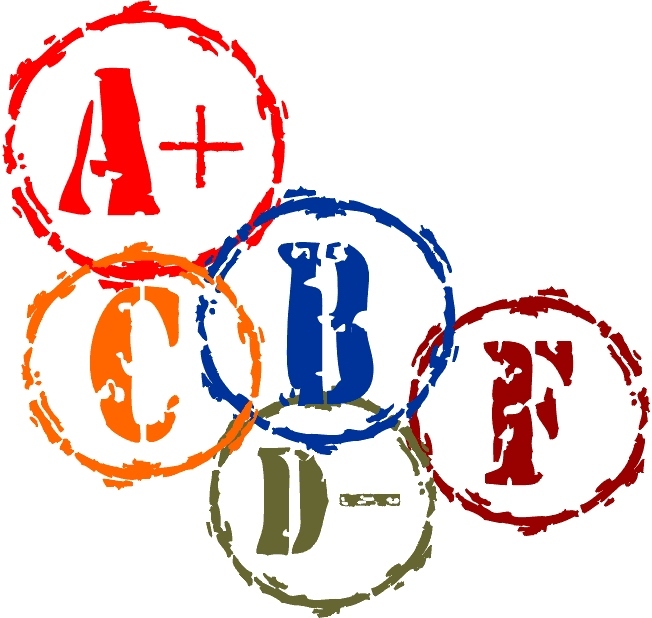 Some not so good. Sure makes us appreciate UltiPhotos! The August 8th episode of Wait Wait Don't Tell Me! 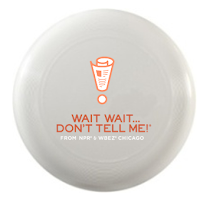 mentioned the IOC's recognition of ultimate during its Listener Limerick Challenge. SAGAL: This week, the International Olympics Committee officially recognized Ultimate Frisbee as a sport. It's pretty easy to recognize, just look for a bunch of sweaty, white guys with dreadlocks. Either it's Ultimate Frisbee or some hobos are fighting over a frozen pizza. 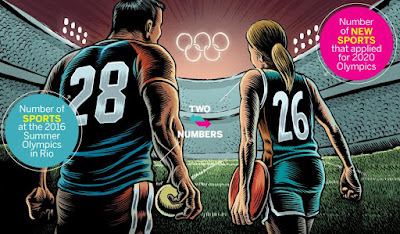 SAGAL: The IOC's endorsement, the sport takes one step closer to being an official Olympic event like trampoline or Bob Costas Synchronized Pink Eye. ALONZO BODDEN: I bet you could get asparagus water to sponsor Ultimate Frisbee. SAGAL: I bet you could. 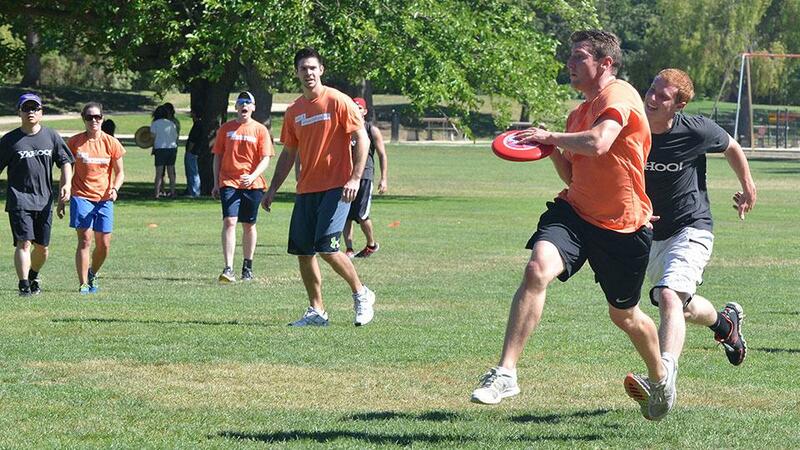 BODDEN: We don't need Frisbee, we already have discus. I think they should have somebody try to catch it. BODDEN: Now, I'd pay to watch that. A specially-designed product targeted to the Rush fanbase. Meta with a side of cutesy! 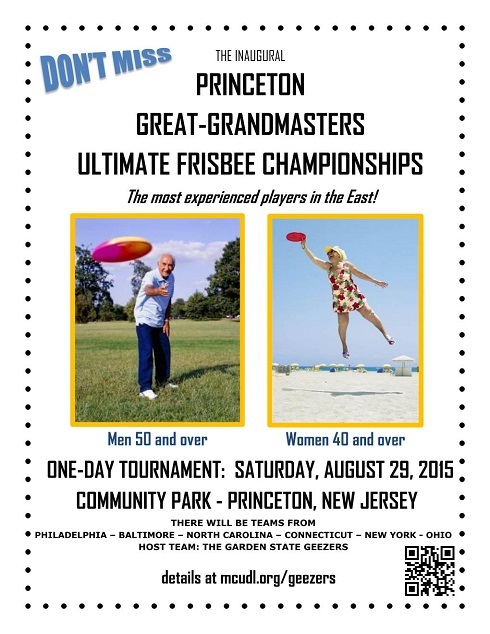 Happy Birthday to the World Flying Disc Federation! 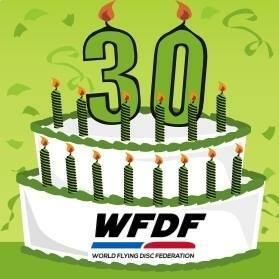 WFDF was formally created 30 years ago today, with the organizing Congress on August 14-16, 1985. 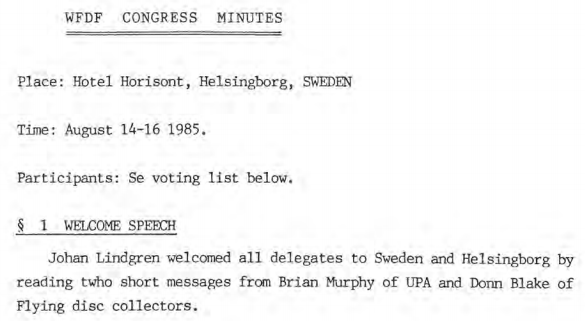 At the meeting in Helsingborg, Sweden, Charlie Langdon-Mead was elected as WFDF's first president, and many committees representing WFDF's objectives were established - Rules Committee, Minority Interests Committee, Ultimate Committee, Guts Committee, Disc Golf Committee, Field Events Committee, and Freestyle Committee. 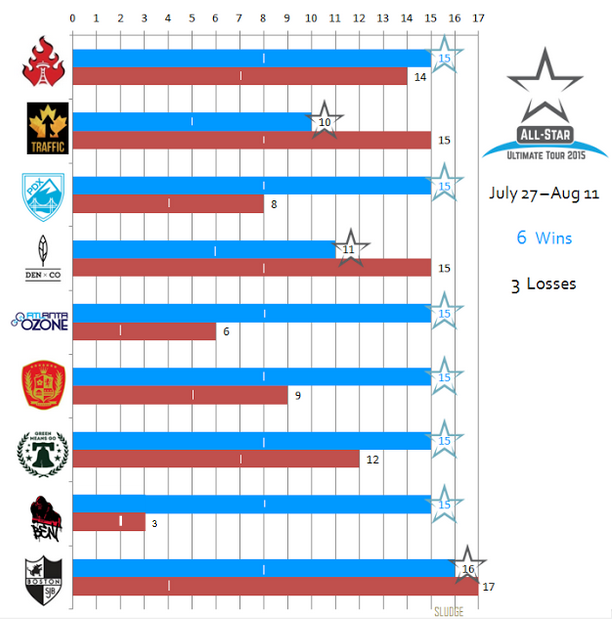 The All-Star Ultimate Tour recently completed their 9-game schedule in July and August. 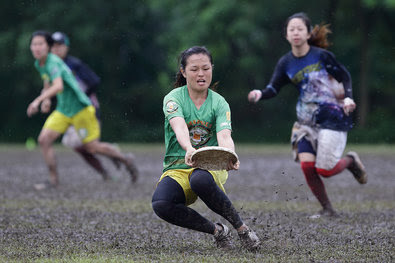 The team of college women ultimate players posted a (6-3) record allowing just 99 goals and scoring 127 total goals - an average of over 14 goals per game! (1-1) = AST record in games decided by 1-goal. Congrats on a successful tour! 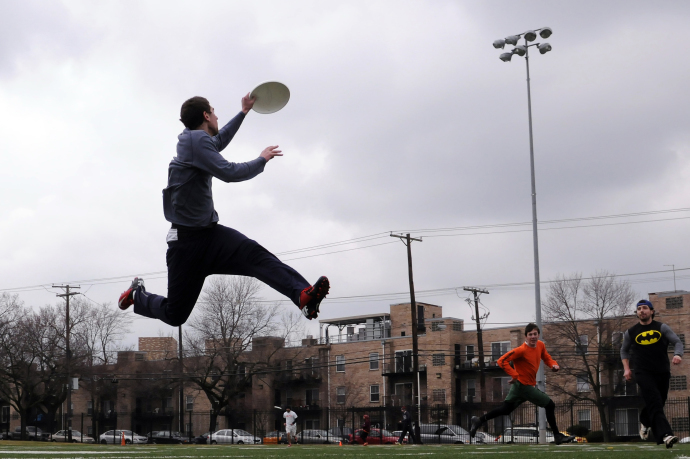 From Correlated: In general, 37 percent of people say they are good Frisbee throwers. 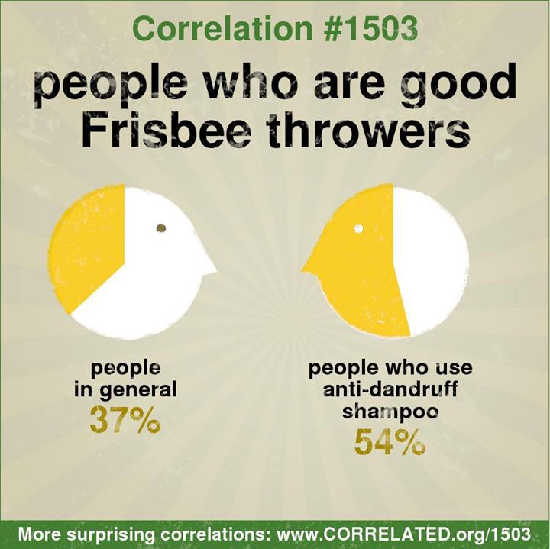 But among those who use anti-dandruff shampoo, 54 percent say they are good Frisbee throwers. 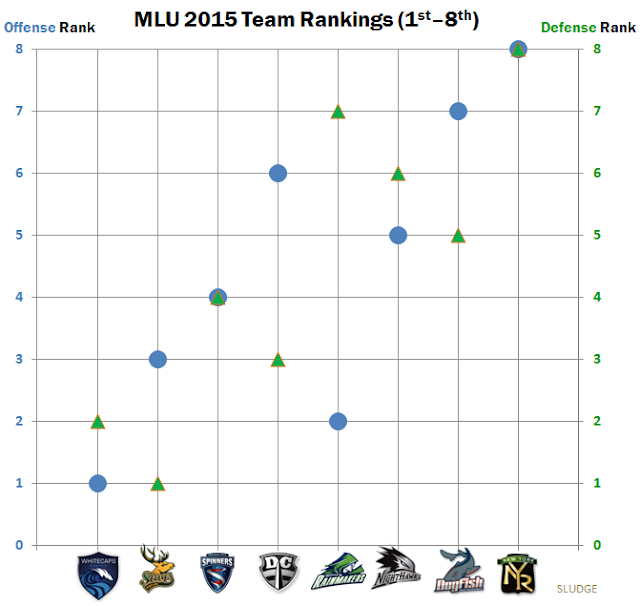 The 2015 AUDL season ended a couple of days ago, so it's time to talk about expansion teams. 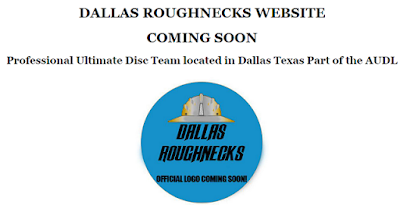 AUstin and DaLlas - for the American Ultimate Disc League are already established with plans to start in the 2016 season. 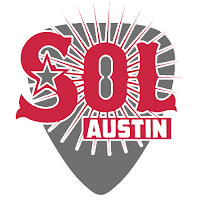 "The Austin Sol are a professional ultimate team in the American Ultimate Disc League (AUDL). 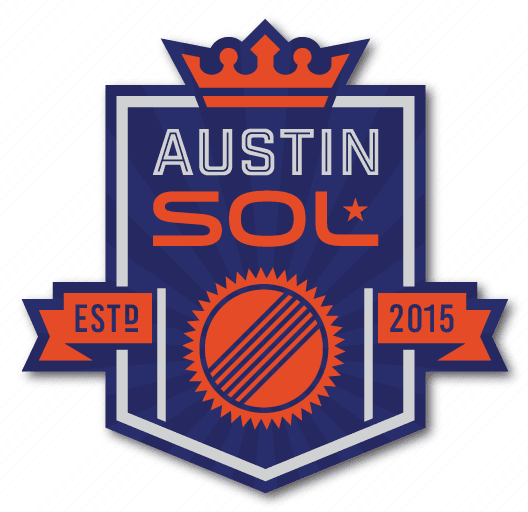 We are scheduled to begin play for our inaugural season in 2016, running from April through July." 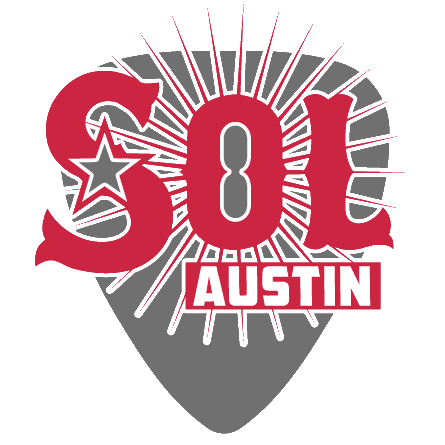 UPDATE 9/2: Austin posted an updated logo on Facebook. 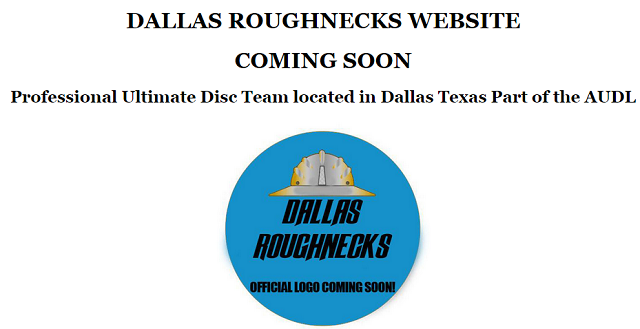 "Professional Ultimate Disc Team located in Dallas Texas Part of the AUDL." 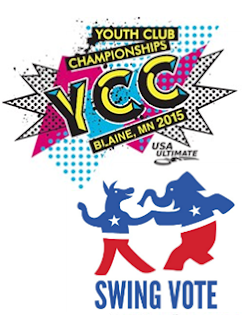 Congratulations to Swing Vote - Washington DC's under-19 ultimate team - for winning the 2015 USA Ultimate Youth Club Championship in the mixed division. The tournament was recently completed August 7-9 in Blaine, Minnesota. Swing Vote posted a (4-1) record in pool play losing only to Bay Area Happy Cows. Swing Vote would meet the Happy Cows again in Sunday's Final. 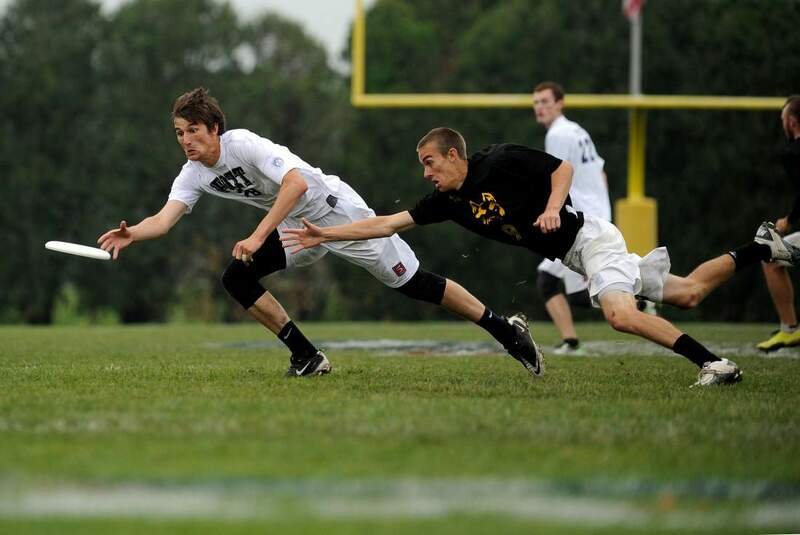 Bay Area was leading 7-6 at halftime and 12-10 late in the game, but Swing Vote scored 3 consecutive goals to win the 2015 title, 13-12. 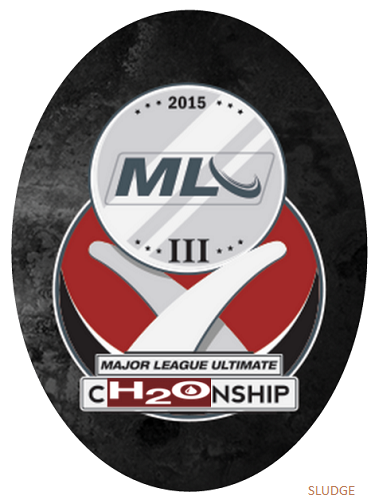 The trophy for the 2015 Major League Ultimate Championship has been updated in honor of the two MLU teams -- Seattle Rainmakers and Boston Whitecaps. 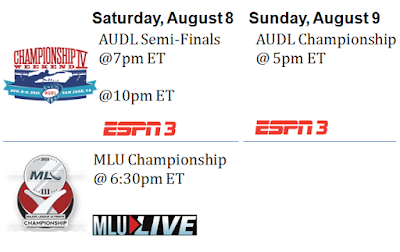 The AUDL Championship Weekend starts tomorrow and the team logos are veRRRy heavy on the R. San Jose looked left out of the paRRRty, so I fixed their logo. 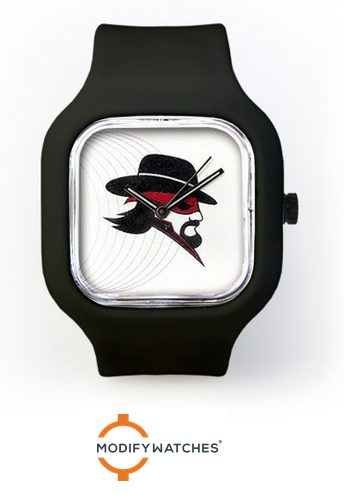 now, it's a true final fouR! Each MLU team played 10 regular season games within their division in the 2015 season. 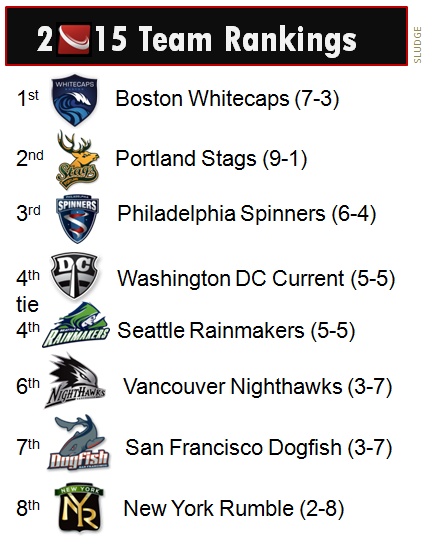 Boston Whitecaps (7-3) led the league in goals (214) and the Portland Stags (9-1) allowed the fewest goals in the league (156). The 2015 league average for total goals per game was nearly 19 points (18.7). If you have plans this weekend, cancel them now! Get ready to watch ultimate on your computer!! 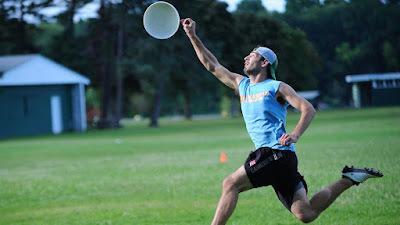 Looking at the cities with two teams in the pro ultimate leagues, how did the 6 cities perform? Compare to 2014 combined records. 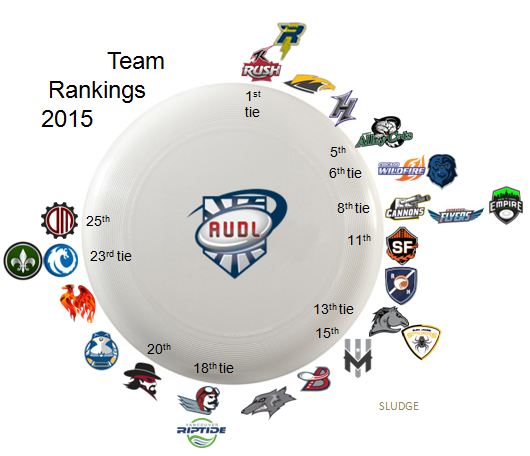 Each AUDL team played 14 regular season games within their division in the 2015 season. The 2015 league average for total goals per game was nearly 23 points (22.7). 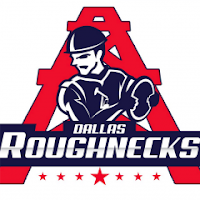 Toronto Rush and Pittsburgh Thunderbirds tied for the the league lead in goals (410), and the Madison Radicals allowed the fewest goals in the league (237). Here's an overall visual ranking by combining offense + defense ranks.